For some time, Iraqi politicians have been discussing a bill proposed by President Jalal Talabani, of the Kurdistan Alliance, on the subject of administrative changes to boundaries of governorates that were altered by the Baath regime. 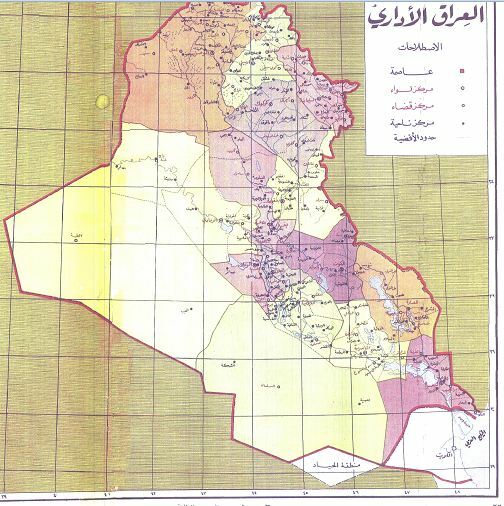 In principle, this discussion has been kept separate from the bigger question of article 140 of the Iraqi constitution on disputed territories. Some politicians have presented the bill as a preparatory step towards the implementation of article 140. Others, including Prime Minister Nuri a-Maliki, have cited the Talabani bill as something that necessitates postponement of the creation of federal regions in parts of Iraq affected by the bill. For a long time, the Talabani bill was known mainly through paraphrases. By now, it is however clear that the proposed law is very short and basically just involves the cancellation of all “unjust” boundary changes by the former regime in pursuance of its “political goals”. Baghdad would swallow Salahaddin, Kirkuk would grow a good deal, Najaf and Muthanna would cease to exist. Importantly, in a consistent implementation, Kurdish-majority Dahuk would also revert to Mosul/Nineveh! Now, presumably that is not what Talabani wants (the Kurds mainly want a bigger Kirkuk), and presumably he is using the words “unjust” and “political aims” in order to create a justification for going back to 1968 generally speaking – but not, of course, when it comes to land given to the Kurds by the Baathists. But that doesn’t make a lot of sense. Dahuk was given to the Kurds by the Baath precisely in pursuance of political “aims”, namely that of creating the first zone of administrative autonomy for a Kurdish minority in any modern Middle Eastern state. To the many Arabs in northern Mosul who suddenly found themselves in a Kurdish-majority governorate, the decision may well have been seen as “unjust” first and foremost. That is why the new Talabani draft law is just another article 140 in disguise. It is trying to create a cloak of objectivity but it has in fact exactly the same failings of subjectivity as article 140 has – disputed territories exist only in the eye of the beholders. As such, the new draft law of Talabani is likely to prove inflammatory to the derailed Iraqi political process rather than a means of facilitating greater rapprochement. It took even longer than last year, but the Iraq annual budget finally passed in parliament today with a solid majority. Many aspects of the budget are similar to last year, with small increases to all the main posts, roughly following the draft that was introduced in December 2011. The big money still goes to the central government and Kurdistan, with some added perks for the ordinary governorates. It is noteworthy that spending on electricity is sharply up compared with 2011, which must be a good sign. Some special features of the last-minute changes to the original draft call for comment. The Sadrists had demanded a petrodollar scheme by which a portion of Iraqi oil revenues would go directly to Iraqi citizens. This idea has indeed been included and was celebrated by the Sadrists as a win for their leader Muqtada. However on closer inspection it seems the money that will actually go to the citizens is whatever surplus is left after deficits have been covered, meaning that unless the oil price increases enormously, there may not be that much money to distribute after all. Money has also been specifically guaranteed for the sahwa pro-government militias in Diyala and Nineveh. This is a response to a demand from the Wasat sub-bloc of the Iraqiyya coalition, and some parliamentarians suggested it constituted the main concession by the government in obtaining Iraqiyya support for the budget. Last year, the Kurds pressed hard to obtain cost coverage for foreign oil companies operating in Kurdistan. This heading still exists, but the main Kurdish achievement this year seems to be the privilege of having the central government financing their electricity sector outside their fixed 17% share of the budget (at least, that is how some Kurdish politicians interpret the new arrangements). By way of contrast, oil is referred to in the same way as last year but with a somewhat Delphic reference to payment of costs to foreign companies “according to all articles of agreement between the oil minister in Baghdad and the KRG energy minister”. Whether this refers to the existing pragmatic cost-oil recovery scheme or something else (and maybe future) remains unclear. As regards the governorates, the role of the governor in implementing investment projects seems somewhat strengthened and in some cases is defined as an exclusive prerogative. The petrodollar scheme for producing governorates also continues, and there is money for the pilgrimage cities (Karbala gets the lion’s share followed by Najaf). Not all of the enhanced governorate focus is necessarily progressive – there are now for example governorate quotas for foreign scholarships. Also, regardless of what the budget says, much of this will depend on implementation capacity in the governorates, which is often substandard. In this way – and perhaps with the added incentive for Iraqi parliamentarians to show up and vote since they will now get their armoured cars as a result of today’s vote – the budget passed despite a pessimistic outlook earlier in the week. What it all amounts to is something of a triumph for embattled Prime Minister Nuri al-Maliki. Critics of this interpretation will perhaps say there are individual clauses in the budget that may limit prime ministerial freedom of action more than before. Some of his own deputies soured today and said silly things (Sunayd: “I consider resigning as a deputy because the parliamentary majority defeated me on article 36!”) But that is besides the point. What Maliki has achieved is a situation in which he doesn’t really need the Iraqi parliament for a long time, providing him with the cover he needs to take a relaxed attitude to demands for national conferences and the implementation of the Arbil agreement. To have achieved passage of the budget under adverse circumstances and with Iraq literally under fire from terrorists today is nothing short of a masterful accomplishment in statecraft. It is quite emblematic of the situation in Iraq that earlier this week, Usama al-Nujayfi, the parliament speaker of the secular Iraqiyya, characterized Iraq as a “derailed train”. Today, Nujayfi went on to play exactly the role Maliki wanted him to play by shepherding the budget vote to a successful conclusion. Maliki plays it well when he manages to buy political support over the budget instead of making political concessions. Symptomatically, perhaps, the Iraqi media almost forgot that another preparatory meeting for the elusive national conference had to be cancelled today because of the prolonged budget debate. That cancellation might well be a bellwether for Iraqi politics for the rest of 2012. There are numerous reasons to try to make an update on exactly how many deputies each of the main political blocs in the Iraqi parliament really controls. Subsequent to the resumption of meaningful parliamentary business in November 2010 – 8 months after the parliamentary elections in March that year – the Iraqi national assembly has seen a string of replacements of candidates for a variety of reasons, as well as cases of very public defections from some of the biggest entities in parliament. With a showdown about the annual budget right around the corner, it makes sense to take stock of the new political balance… Full story here. Towards Asymmetrical Decentralisation in Iraq? Maybe it was the physical dislocation of the Iraqi cabinet and Iraqi journalists to the southern port town of Basra that was the reason. Perhaps it had to do with a desire on the part of Prime Minister Nuri al-Maliki to somehow please his constituency in Basra at a time when pro-federal Sunni movements have forced him to take a negative stance on the creation of new federal regions generally. Whatever it was, Iraqi politicians and journalists produced an amazing array of misleading statements subsequent to the first meeting of the Maliki government outside the capital Baghdad yesterday. وقال الشهرستاني في تصريح صحفي ان :” مجلس الوزراء قرر في جلسة عقدها اليوم في البصرة منح المحافظ خلف عبد الصمد صلاحيات وزير فيما يتعلق بصرف المبالغ الخاصة بالمشاريع الخدمية الى جانب ابرام العقود النفطية في خطوة ينشد منها المجلس توسيع صلاحيات الحكومة المحلية في المحافظة “. واشار الشهرستاني الى ان ” قرار المجلس اعطى المحافظ صلاحية التوقيع على صرف مبالغ تتراوح ما بين 50 الى 100 مليون دولار والتي كانت سلفا حصرا بالوزير ، كما مكن المجلس المحافظ من احالة المشاريع وابرام العقود مع الشركات (بضمنها ا النفطية) دون الرجوع الى الوزارات المعنية بالامر “. Many observers were skeptical, but for the next 24 hours the stories made their way through Iraqi media anyway – complete with parliamentarians commenting for and against the assumed cabinet decision. After all, the Iraqi cabinet already violates so many fundamental features of the Iraqi constitution (including the right to form federal regions) that it wouldn’t necessarily be shocking for it to introduce yet another infraction, however outlandish. 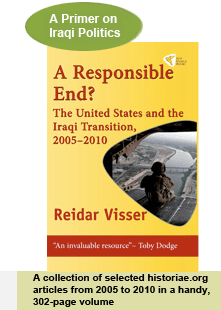 What this whole little affair has revealed, however, are the large gaps in the legislation regulating centre–periphery relations in Iraq – as well as considerable ambiguities in the Iraqi constitution itself. Everyone talks about the “spending cap” for governorates, but where exactly has that been legislated? Is it in the provincial powers law of 2008 or in the annual budgets?? This problem in turn relates to the fact that the provincial powers law of 2008 did not really do much to demarcate responsibilities between governorates and ministries in so-called “shared” areas of government (articles 112 and 114 of the constitution). What it did, first and foremost, was to create a sack-and-appoint procedure whereby local politicians were given a say in the appointment of high-level officials of the central administration working in their governorate (health, police, education etc.). Similarly, today, the Kurdish MP Bayzid Hassan expressed outrage about the alleged cabinet decision to give Basra contracting powers for the oil sector. This “has to be legislated”, he demanded. But his outrage is misguided. According to article 112, federal regions and producing governorates enjoy exactly the same rights as far as oil is concerned. Basically, if KRG can sign – and that is a big if, depending on how one reads the rest of 112 – Maysan can sign. There is no other possible reading, regions and producing governorates have equal constitutional status as regards energy (and residual powers, article 115), period. Incidentally, this means that if any of the current draft versions of the oil and gas law actually passes in parliament, it will be unconstitutional from the get-go since all versions bestow contracting rights on federal regions but not on producing governorates. Most commenters dismissed the story about Basra contracting rights as unrealistic, not least given the past record of centralism on the part of Shahristani in particular. What the episode actually highlighted was yet another fundamental contradiction between the Iraq outlined in the constitution of 2005 and the way the country actually works. Tomorrow, Sunday, Iraqi leaders will once more meet to make preparations for their next big get-together. When, or if, there is ever a national conference-style gathering in Iraq – possibly to downgrade expectations it is now officially just called a “national meeting” – it is unlikely to turn into the implementation of the far-fetched and shadowy Arbil agreement. At most, the meeting will end in renewed agreement in principle to legislate non-implemented aspects of Arbil (strategic policy council, oil and gas law etc.) whereupon those pieces of draft legislation will come up against the usual stalemates when they actually reach the floor of the Iraqi parliament. It could be argued that only two items in the Arbil agreement stand out as having some realistic chance for implementation: Cabinet bylaws and the distribution of the security ministries. Maliki knows perfectly well that the inclusion of the cabinet bylaws as a separate item at Arbil was aimed at restraining himself as a potential strongman. However, unlike many of the other items in the Arbil agreement, on the bylaws one Maliki cannot easily hide behind the claim that the proposed mechanism is outside the constitution. In fact, the constitution specifically demands the adoption of bylaws for the cabinet (85), and not even a parliamentary decision is needed. What Maliki can do, of course, is to rely on the proven ability of Iraqi politicians to quibble forever over even the most inconsequential details, making it a safe bet to assume that no early adoption of cabinet bylaws is terribly likely. That aspect should be kept in mind also by those who want to use the upcoming meeting for the purpose of modifying what they see as highhandedness on the part of Maliki. Perhaps they may want to have a look at the second implementable item instead: The allocation of the security ministries. For more than one year, the security ministries have been in the hands of acting ministers – Maliki himself for interior, with close allies at defence (Dulaymi) and national security (Fayyad). Two main attempts at having them filled through parliamentary procedure (March and May 2011) both failed. There is general agreement that the jobs should be filled by professionals nominated by the secular Iraqiyya (defence ministry) and the Shiite Islamist National Alliance (interior ministry) respectively, although attempts have been made to Maliki to define the defence ministry as reserved for a Sunni rather than an Iraqiyya candidate, which could enable him to impose a figurehead instead. Critics of Maliki claim the current acting (Sunni) defence minister is precisely such a figurehead. The dynamics of the security ministries have changed somewhat over time. Initially there was considerable intra-Shiite conflict between Maliki’s State of Law and the other Shiite parties, and the Sadrists in particular, about who should become interior minister. The Sadrists at one point wanted Ahmed Chalabi for interior minister; Maliki favoured Shiite professionals who had worked for the old regime. More recently, there has been renewed focus on the Shiite candidates for the interior ministry, with a more consistent chorus of voices suggesting Tawfiq al-Yasiri, who was once in the Iraqi army but fled after 1991, is now the consensus candidate of the Shiites and that he also enjoys some support from Iraqiyya and the Kurds. The problem now is apparently that Maliki has rejected a string of defence ministry candidates from Iraqiyya, citing de-Baathification in ways that look inconsistent with how he himself is in the habit of employing Shiites with a Baathist past. In fact, it seems Maliki is actually quite happy with Dulaymi as acting minister. It is not entirely unlikely that Maliki is using the candidacy of Yasiri mainly as a fig leaf and that he is actually also happy with his close ally Adnan al-Asadi continuing to exert de facto control at the interior ministry. If that assumption is correct, probably the only way Iraqiyya can obtain support for one of their own candidates at defence is to think outside the box. What Iraqiyya could do in order to make Maliki change his mind is to remind him of the fact that the Sadrists are waiting in the wings with a claim for a deputy interior minister. If they want to reach out to Maliki, Iraqiyya could make sure to support an interior ministry candidate that the other Shiites detest. There is precedence for this: In the second half of April 2011, Maliki reportedly offered Iraqiyya to support their candidate for defence if they would give him the necessary support to get rid of Ahmed Chalabi as the interior ministry candidate of the Shiites. Maliki has similarly resisted other candidates for the interior ministry considered too close to the Sadrists such as Abd al-Karim al-Sudani. As recently as September 2011, Maliki was in trouble in Maysan when he imposed a police chief (Ali Ghazi al-Hashemi) with a military and Baathist background against the wishes of ISCI and the Sadrists. Alas, Iraqiyya is apparently not thinking along those lines at all. In a sad repeat of their manoeuvres to obtain Shiite support for their Ayyad Allawi as premier candidate in summer 2010, Iraqiyya leaders have once more been courting ISCI and Sadrists in order to “challenge” Maliki. As has Turkey. As has the United States (minus the Sadrists). These players just don’t see that the “challenge” to Maliki will never tip the balance. If Iraqiyya proceeds like this, one of the few likely results of the upcoming national meeting could be the appointment of a Sadrist deputy interior minister. How wonderful. With the approaching one-year anniversary of the first tentative Arab Spring demonstrations around Iraq (25 February), Iraqi politicians appear unhurried and unworried. Maybe lackadaisical is a better term? Iraqi leaders certainly seem to be “lacking in life, spirit or zest” these days. Yesterday saw yet another preparatory conference designed to reach agreement on the forthcoming and much anticipated “national conference” which will address problems inside the current cabinet that the cabinet members themselves cannot solve. It turned to be yet another pre-preparatory conference: Essentially nothing was agreed. To add insult to injury, the delegates nonetheless had the audacity to produce a “concluding statement” that reaffirmed opposition to terrorism, agreement on the constitution as the key to solve Iraq’s political problems, consensus that all components of Iraqi society need to be represented in the political process, and respect for the neutrality of the judiciary. Mashallah. There was reportedly a fifth point, but early media reports failed to identify it. The bigger point is this: These are just generalities that every Iraqi politician will say s/he supports all the time. Upon closer inspection, the definition of terrorism, the interpretation of the constitution, the operalisation of inclusiveness in the political process and the meaning of a neutral judiciary are all disputed. This is nothing new. The same problem pertains to the elusive Arbil agreement whose implementation is the supposed topic of the planned conference: If the agreement exists at all, it is extremely ambiguous and so dependent upon subsequent action by the Iraqi parliament, constitutional changes and approval of them in referendums that it means next to nothing. This is why the national conference, if it ever comes into existence, is likely to be a redo of the “strategic policy council” that occupied many highbrow commenters in 2010 – i.e. either it never happens, or, if it actually happens, it will have no power and real meaning. The remarkable thing is the patience of the Iraqi electorate in the midst of this procrastination. On 25 February we will have the one-year anniversary for the limited Arab Spring tendencies that were seen in Iraq in 2011. It is plausible to attribute the shrinking of the oversized Iraqi cabinet in summer 2011 to heightened popular pressure, but other than that there was no revolutionary impact on Iraqi politics. The cabinet is still much too big and incoherent. As for the ongoing quest for a national conference, there is everything to suggest that it will never become the frank discussion of the Arbil agreement that some have been demanding. In particular, it has become clear that the document presented by the Shiite alliance to the leadership conference yesterday deliberately included a much broader scope of issues than that hoped for by Iraqiyya. Not least, there was specific emphasis on the relationship between Baghdad and Kurdistan, with the portfolios of oil and peshmerga financing highlighted. This seems like a clear strategy by Maliki for bringing an end to tendencies of rapprochement between dissatisfied Kurds and the secular Iraqiyya by inviting the Kurds to come over to his own side. It is natural that the Iraqiyya leadership should be in for some criticism these days, since their 6-week boycott produced few results and mainly served to underline internal fault lines. The boycott ended today with the return of the Iraqiyya ministers to cabinet. Nonetheless, it should be stressed that Maliki has not done that much to exploit the situation either. Had he been truly versatile, he would have rushed to adopt defecting Iraqiyya members to his own bloc and made sure to get the budget passed in parliament with Iraqiyya on the sidelines. This didn’t happen, and Maliki still needs the budget to pass. Parliament has adjourned until 14 February. Some commenters will probably say it is wonderful that Iraqi politicians are talking instead of killing: Half full not half empty. But with some of the world’s biggest oil resources, Iraqi citizens deserve better than this. Maybe over coming weeks, as the 25 February anniversary moves closer, there will be greater debate among Iraqis about the relative merits of passing the annual budget versus the multitude of other issues their politicians want to discuss at their great conference. The project to adopt a constitution for the federal region of Kurdistan (KRG) can be classified as one of the “silent drivers” of Iraqi politics. The current draft constitution of the KRG was finalized by the Kurdish parliament in 2009. At the time, a referendum on it was expected but it was eventually delayed. Some attribute the delay to internal bickering among the Kurds; others say pressures from Baghdad played a role. At any rate, Kurdish politicians – and Kamal Kerkuki in particular – are once more talking about the need to have a referendum on the Kurdistan constitution. Reactions from outside Kurdistan have been quite massive. The main reason the KRG constitution is sensitive to Iraqi politicians beyond the Kurdistan region itself is the definition of the Kurdistan region contained in the draft constitution. This includes several areas in the governorates of Wasit, Diyala, Salahaddin, Kirkuk and Nineveh that are claimed by the Kurds but are not currently controlled by them. Politicians in areas claimed by the Kurds in Diyala, Kirkuk and Nineveh are particularly furious about the renewed talk about a referendum. The protestors make reference to the constitutional principle that no law passed in Iraq can contradict the constitution itself. Does the Kurdish constitution contradict the Iraqi constitution? Technically speaking, it certainly does. This is so because the definition of the Kurdistan region in the Iraqi constitution is very clear: Article 142 says article 53A of the Transitional Administrative Law from 2004 shall remain in force; that article in turn says “The Kurdistan Regional Government is recognized as the official government of the territories that were administered by the that government on 19 March 2003 in the governorates of Dohuk, Arbil, Sulaimaniya, Kirkuk, Diyala and Neneveh”. Of course, Kurdish politicians will lose no time in reminding us that also article 58 of the TAL regarding the settlement of “disputed territories” was given extended life through articles 140 and 142 of the constitution; their staunchest opponents say the failure to implement article 140 by the constitutionally mandated deadline in 2007 signified its death. Irrespective of the legal complexities involved, it is noteworthy that in political terms, key allies of Prime Minister Nuri al-Maliki have previously invested considerable energy in criticizing the Kurdistan constitution for being in conflict with the Iraqi constitution. Importantly, this goes beyond predictable resistance from Turkmen allies of Maliki like Abbas al-Bayati. It also includes people like Sami al-Askari, who in the past has specifically spelt out the differences between the TAL definition of Kurdistan and the definition contained in the Kurdish draft constitution. The revival of the Kurdistan constitutional referendum question highlights the long-term options before Maliki today. Maliki can choose to work with the Kurds, support their constitutional referendum plus implementation of article 140 (or the light version proposed by President Talabani). This will inevitably make him look sectarian in the eyes of many Sunni Arabs, who are among the main opponents of Kurdish expansionism – and will in turn likely make him more dependent upon Iran. Alternatively Maliki can work with Iraqiyya, or with splinters from Iraqiyya, in which case it would be easier to keep Iran at an arm’s length. But this would also raise the prospect of full secession by Kurdistan, possibly followed by armed conflict to settle final boundaries. More likely, Maliki will try to avoid making too strong commitments to either side. In the meantime, however, he still needs some political allies to get the annual budget for 2012 passed.